For this week's walking tour I'm going to take you to a location from my novel Binding Arbitration. Here's a short clip of a scene that takes place in this fabulous restaurant. We met Libby in front of the red and white neon sign for Italian Village. Cass spun through the revolving door twice before bounding up the white limestone stairs that my parents had been climbing for more than thirty years. Libby was too busy fidgeting with her clothes, buttoning and unbuttoning her suit jacket to notice the maitre d’s admiration as he took her coat. Cass was watching the miniature model of an illuminated Ferris wheel spinning in time with ‘Moon in the Sky Like a Big Pizza Pie.’ The long narrow interior reminded me of the crowded streets of Rome, but the room opened up like a Piazza with a bubbling fountain in the center of the uneven cobbles. An Italian countryside landscape roved along the wall. Our private booth had an overhanging tile roof, almost as if we were on a secluded veranda of an Italian Villa. My parents sat on one side of the booth, the back of which ran to the ceiling, enclosing the small room so they couldn’t stand. They both smiled shaking first Libby’s hand, then Cass’. My father smiled with his initial perusal of Libby, before he looked at me and winked. 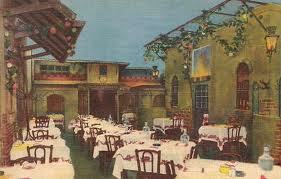 If you plan a visit to Chicago I recommend a visit to the oldest, and in my opinion best Italian restaurant. Make sure you order the Spaghetti with meatballs. Ah! I'm ahead of you, I have the best recipe for Spaghetti Bolognese and it's super easy and kids LOVE it!! !